A new global study finds that while the use of artificial intelligence (AI) is low today, it is expected to create increased revenue, productivity, profitability and shareholder value for businesses within two years. Overall, only 16 percent of business leaders surveyed perceive they are currently garnering significant value from advanced AI. However, AI programs are being fast-tracked and that number is expected to more than triple to 52 percent within the next two years. This is according to a new report, Competing in the Cognitive Age: How companies will transform their businesses and drive value through advanced AI, by global consulting firm Protiviti in collaboration with ESI ThoughtLab. To understand how companies will transform their businesses through applications of advanced AI technologies and the benefits they expect to gain, Protiviti and ESI ThoughtLab conducted a global survey of 300 senior executives across functions, industries and company sizes in the third quarter of 2018. The study found that nearly one third of all respondents perceive their organization’s use of advanced AI is ahead of their competitors, and 92 percent of those respondents expect to see high or very high value from AI in two years. Protiviti evaluated the survey data by company, region, industry segment and size to discover which vertical industry segments are gaining the greatest benefits from AI today. Asia-Pacific companies are leading the way in driving business improvements with AI technology, with 35 percent reporting that advanced AI is currently providing “significant value” to their business, compared to 14 percent of companies in North America and 7 percent of companies in EMEA. The full report is available on Protiviti’s website at www.protiviti.com/AI for complimentary download, along with an executive summary, infographic and short video about the study’s findings. 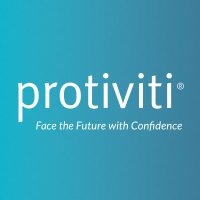 Protiviti will host a live webinar to explore the study further on February 27 at 11:00 a.m. PST. The one-hour session will feature Protiviti’s Madhumita Bhattacharyya, Ron Lefferts and Shaheen Dil. To register for the free webinar, please visit www.protiviti.com/AI.